Taken from 60 More Quick Knits: "Deceptively simple looking, these mitts are packed with interesting techniques, including diagonal and asymmetrical ribs. Contrasting edgings add more visual interest." 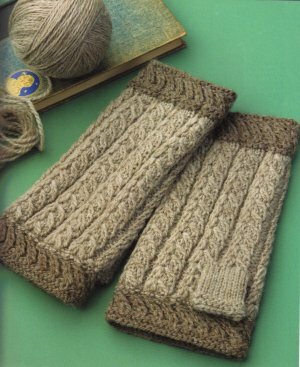 This pattern is from 60 More Quick Knits, pg 90 - Ribbed Fingerless Mitts. Size US 4 DPNs (or size needed to obtain gauge) are required but not included. Colors shown are #8012 Doeskin Heather & #8013 Walnut Heather. These colors are currently unavailable, but check out the options we have listed below! $10.50 -- Kit price including yarn only (no book or pattern).